IMPROVING THE QUALITY OF LIFE FOR KIDS LIVING WITH CANCER Wigs for Kids BC (W4K BC) started in the spring of 2006 by a group of friends. They wanted to raise money for a teenager living with cancer who needed a wig to wear to her high school graduation. The group held a small silent auction and hoped to raise $3,000. When they raised more than $24,000, they realized their fundraising efforts had the potential to make an enormous difference for many more children living with cancer. What began as a mission to help one young girl grew into a vision to help as many children as possible. W4K BC committee members at Miracle Weekend in June 2013. Thanks to the work of this dedicated, innovative committee and its chair, Bev Freisen, W4K BC has now raised more than $500,000 and helped over 500 children. This has been made possible by the outstanding response to the committee’s outreach activities, which included sending out and following up on close to 4,000 letters to the community. By contributing to Wigs for Kids, you are making a tremendous difference in the lives of children living with cancer – and their families – across the province. Wigs for Kids is proud to be an entirely volunteer-run organization with all proceeds supporting the program’s initiatives. W4K BC helps kids living with cancer, live better. Their goal is to boost a child’s confidence, allowing them to experience life with fun and dignity. In 2009, at the request of BC Children’s Hospital, W4K BC expanded its mandate beyond wigs to raise money for essential drugs and feeding supplies – treatment components not covered by the Medical Services Plan of BC (MSP) – for children with cancer. 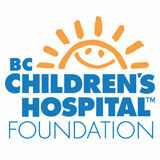 CHILDHOOD CANCER AND ITS IMPLICATIONS In BC, about 130 children are newly diagnosed with cancer each year. It is the most common disease-related cause of death in children from one to 19 years of age in North America. Though the chance of complications in the treatment of childhood cancer can be high due to the often toxic side effects of conventional treatments like chemotherapy, for the most part, children respond well to todayâ&#x20AC;&#x2122;s therapies and more are surviving than ever before. Among the side effects of chemotherapy are heart damage, hearing loss and hair loss. Although hair loss from chemotherapy is generally not permanent, it does take a toll on the child and can cause severe emotional distress â&#x20AC;&#x201C; especially in teenage girls. Minimizing the impact of all side effects, including hair loss, is an important part of cancer treatment and care. Forty years ago, only 10 per cent of children diagnosed with cancer survived. Today, thanks to advances in research, care and treatment, survival rates for some types of childhood cancer exceed 80 per cent. W4K BC is helping to improve the treatment and recovery process for these children, enhancing their lives physically and emotionally. Alex Walker (right) with Noah Epting, who cut off his ponytail to be used for wigs and, along with his family, has since become friends with Alex. A MESSAGE FROM ALEX WALKER In January 2010, Alex Walker was diagnosed with a type of cancer that affects the white blood cells and lymph nodes. Since then, sheâ&#x20AC;&#x2122;s endured nine rounds of chemotherapy and says that the loss of her hair was among the most traumatic side effects of her treatment. Thankfully, within four months, Alex was in remission and her treatment ended at the end of August. Today she is cancer-free, studying sociology at the University of British Columbia, and helping to give back by raising awareness and funds for W4K BC. FAMILY AND PATIENT SUPPORT W4K BC funds human-hair wigs for children and teens who have suffered hair loss due to cancer treatment or other serious illnesses. It also raises money to help families pay for certain drugs and feeding supplies for which MSP does not pay. These services are easing financial strain and providing peace of mind for families in their most trying times. Receiving a cancer diagnosis for a child is devastating for the entire family. At this time of significant stress, in addition to worrying about their child’s health, parents also have to think about paying for medication, feeding support and wigs. These financial demands can be difficult for parents to manage and they can significantly impact a family’s ability to cope with their child’s diagnosis and treatment. The support available through W4K BC reduces much of this financial burden for families, allowing parents to guide their child through a very difficult experience rather than spending time and energy worrying about money. Andrea Johnson, a social worker at BC Children’s Hospital who works with children living with cancer and their families, has worked with many adolescents through hair loss. She says she consistently sees happiness and peace when the teens return with their wigs. “I remember working with one adolescent who was so scared and nervous to get a wig,” says Andrea. “She did not know what to expect and did not think she would be able to find a wig that made her feel comfortable. I remember seeing her in the hospital after picking up her wig and she had a huge smile on her face and told me ‘now I feel more normal.’ For any adolescent, I don’t know if there’s anything more powerful than feeling that. Wigs change the lives of our patients and we, and they, are so grateful for this funding support.” Andrea, who helps children and families cope with the psychological and emotional effects of cancer, was the person who told Alex Walker and her parents, Mikkey and Gordon, about Wigs for Kids. Alex’s parents contacted W4K BC, and received a custom-made human-hair wig for Alex free of cost – and it changed her life. On January 13, 2013, Hennessey Salon and Spa in Richmond hosted its third annual Hennessey Hair “Do” to raise money for W4K BC. Up to 20 Hennessey stylists from across the Lower Mainland donated their time to cut and style hair for 186 clients. The event raised over $19,500. 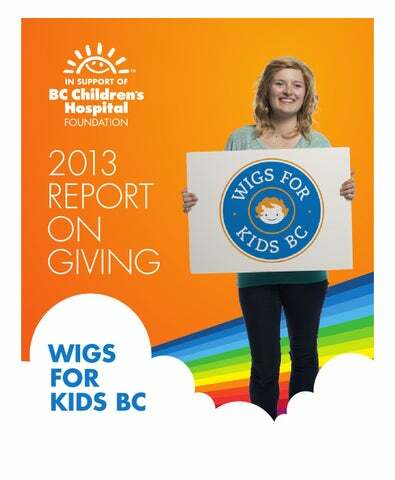 On July 21, 2013, W4K BC hosted the first Papillon Spa Day with all proceeds going to Wigs for Kids. W4K BC is honoured to be supported by numerous independent events organized by caring members of the community across the province. These events include silent auctions, pub nights and proceeds from retail sales. W4K BC encourages communities throughout the province to organize and host independent events each year. Last year, fundraising events ranged from a small local-Legion cut-a-thon to a bonspiel â&#x20AC;&#x201C; a curling tournament â&#x20AC;&#x201C; to a pub night in Kelowna organized by a child who received a wig and her mom.Â All of these events help to raise much-needed funds for and awareness of W4K BC. Your contribution to W4K BC is helping to improve the quality of life for children who are living with cancer and other disorders. By giving them confidence and peace of mind when they need it most, you are making a tremendous difference in their lives. Thank you for your generosity.